After succeeding in changing how economic incentives are granted in Louisiana, and teaching local municipalities and school districts how much tax exemptions cost the people they serve, Together Baton Rouge (TBR) leaders identified another source of public revenue loss: property tax roll omissions. Vigilant leaders of TBR discovered that approximately $400 million in taxable property (at four Baton Rouge facilities owned by ExxonMobil) appears to have been omitted from the preliminary 2018 property assessment rolls provided by the East Baton Rouge Parish Tax Assessor. Left uncorrected, this apparent omission of taxable property would result in a one-year loss of approximately $5.9 million in revenue to East Baton Rouge Parish taxing bodies over the next fiscal year, including a loss of $2.7 million to East Baton Rouge Parish public schools in the current fiscal year (a year in which the school district is running a multi-million deficit). 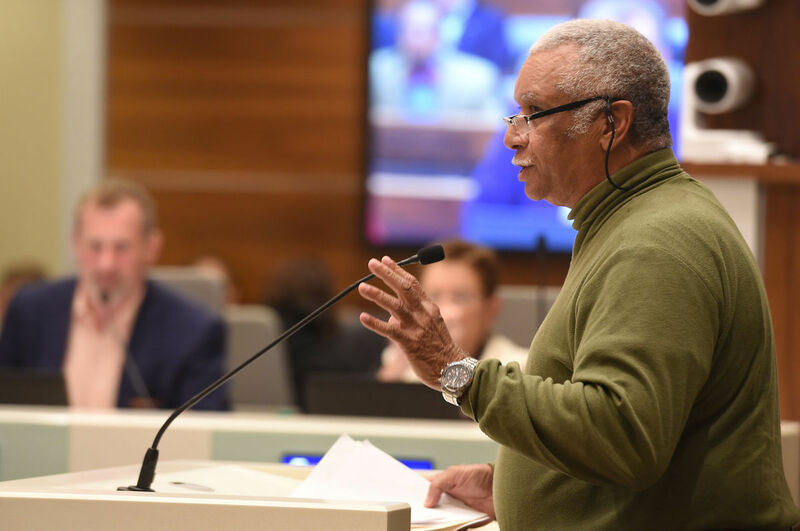 After compelling testimony and intervention by leaders from Northern & Central Louisiana Interfaith, the Shreveport City Council reduced Calumet's tax exemption request by 49%. The original request was for $858,444.30 and the amount approved totaled $437,769.70. Braving torrential rains, hundreds of Louisiana Association of Educators and Together Baton Rouge leaders publicly launched, together, a public campaign to raise teacher pay (see photo above). As the Baton Rouge Industrial Tax Exemption Program (ITEP) Committee considers new rules for local application of industrial tax exemptions, they heard starkly different stories by citizens and corporate executives. The Baton Rouge Area Chamber of Commerce proposed dramatically looser rules on tax breaks, excusing some business from paying any taxes for five years, depending on the size of the corporation. 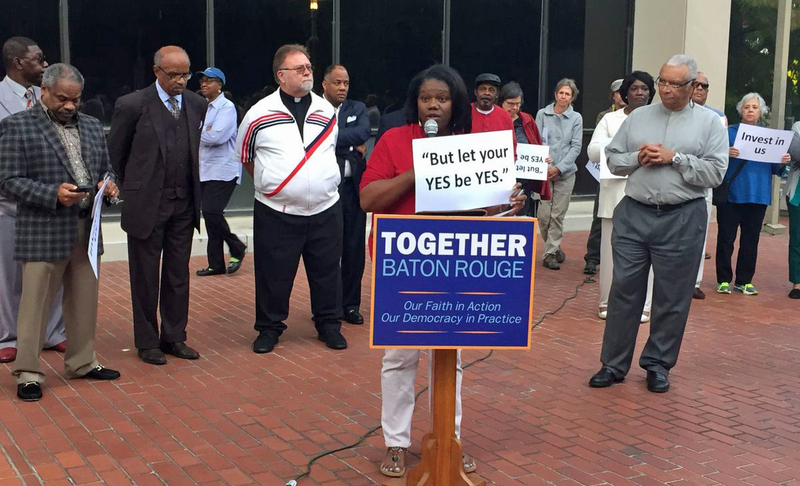 Small business owners and citizen leaders of Together Baton Rouge called on the committee to ensure that tax incentives require job creation and serve in its designed capacity to incentivize (future) business investment, rather than pay for past expenditures. The local nature of this debate is the result of Together Baton Rouge's efforts to de-centralize tax break decisions so that local entities sacrificing the tax revenue can weigh in on industrial tax break decisions. For the first time in the history of Louisiana's Industrial Tax Exemption Program, a school board rejected an application in order to preserve public funding for its schools. 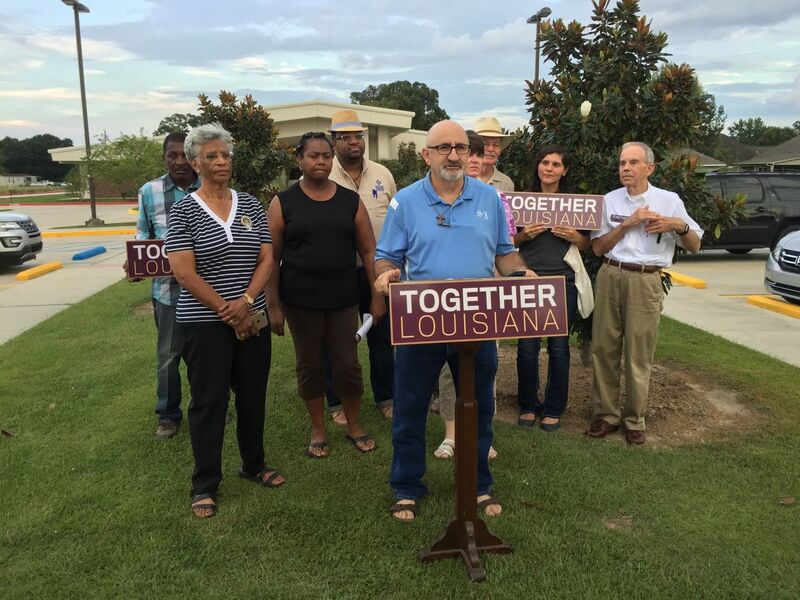 Northern & Central Louisiana Interfaith (NCLI) leaders and Caddo Parish teachers spoke passionately at a Caddo Parish School Board meeting, asking board members to "put the students first." As a result, the Board voted to deny exemptions from school board taxes for Inferno Manufacturing, Inc. Pointing out that nearly 100,000 Baton Rouge residents live in food deserts, and that during fall elections mayoral and city council candidates publicly committed to investing $1.5 Million to attract grocery stores in the region, leaders of Together Baton Rouge are calling foul on the council's failure to invest any money in the effort for four straight years.